Breakfast time is believed to be the most important mealtime of day. Individuals who don't eat breakfast can consume an average of 100 calories more than those who eat breakfast. Starting your day off healthy meal also helps you snack less rest of the day and keeps your metabolism running better and high. Since, breakfast time has a significant importance in starting a healthy day, enjoying a nutrient-rich breakfast can keep your blood sugar levels even, which are helpful in staying alert with a better mood. Some of the healthy meal ideas for your breakfast include cold cereals including granola, Bagels, Pancakes and waffles, Conventional bacon with sausages, Instant oatmeal, Juices, French toast and eggs. With a busy routine life, it's,​sometimes, hard to find the necessary time to fix breakfast items in the morning. Following are some quick meal ideas that hardly take any time to be prepared and are healthy to eat. This takes just a minute to prepare and five minutes to eat. Whole grain cereal with skim milk makes a healthy, tasty and quick breakfast idea especially when your children are running late for school. It serves as a super fast healthy and delicious bite in the busy hours of morning. All you need to do is toast a whole-wheat bagel with some peanut butter. You can also add a piece of fruit such as a banana or an apple to your meal. Eggs are full of protein and make a healthy meal option for your morning. Keep some boiled eggs and your favorite sandwich filling for egg sandwich in your fridge for a "quick" use. Just slice the boiled egg and spread its filling such as some honey on the bread and sprinkle little salt and black pepper onto it. Mayonnaise can also be used as a filling option for your egg sandwich. Breakfast Smoothies is the breakfast idea that was particularly invented for busy people. A bowl of blended yogurt or milk with added scope of protein powder and some fruit make a tasty and nutrient-rich breakfast within no time. It’s just one quick recipe, there are lots more great recipes available for breakfast smoothies. Oatmeal serves as a healthy breakfast option that can also help you lose weight. It’s high in fiber and very filling. Its nutrient-full whole grain is a great source of carbohydrate that makes you feel more satisfied for longer time. However, the key is portion size and what you add to your bowl of oatmeal. Yogurt is easily available food item which can also be used in breakfast. It improves your immunity against diseases and helps your body digest the food and eliminate unwanted fat from your body in order to make it healthy. 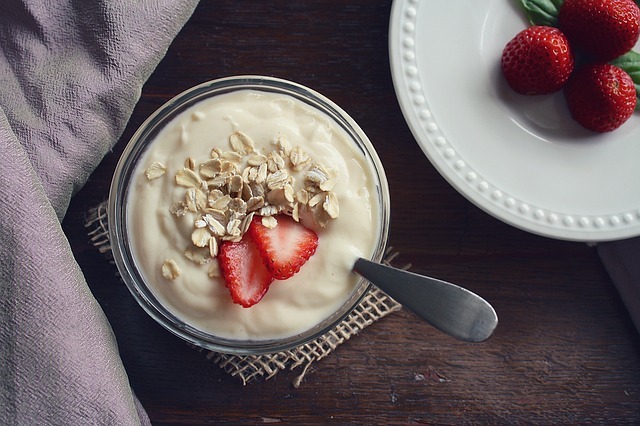 Yogurt can be consumed with a number of fillings such as sugar or nuts. Also, if you like, you can also sprinkle some salt and pepper onto the yogurt to make a salty delight for your morning meal. With the above ideas, you have no excuses to skip the most important meal of the day. Try a few of these ideas in order to find yourself more active in the morning.